The Herrera Hideaway exudes mountain charm and an adventurous style. Though quaint in size, it is pet friendly and kid friendly, and is just what you need for a family vacation or romantic getaway! The front door leads to the deck overlooking the forrest and fire pit area. The deck is the perfect place to relax, grill, and enjoy the great outdoors. This two bedroom cabin is fully furnished with two double beds, a single bunk bed (sleeps two) and pull out couches. The kitchen is fully stocked with dishes and utensils, and even a Keurig. There is a small bathroom with a full shower off one of the bedrooms. *The bunkbed bedroom has a thick curtain in leu of a door. All bedroom, kitchen and bathroom linens are included at no extra charge! 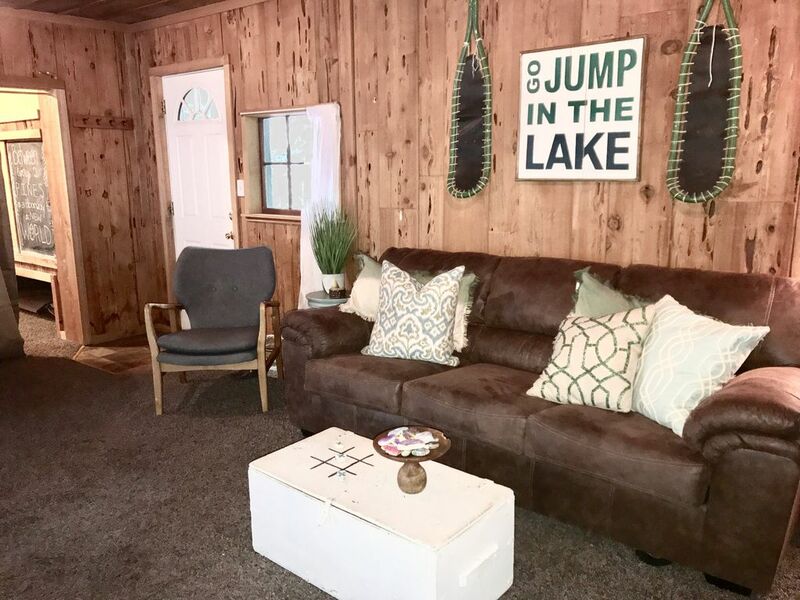 If you are traveling to the Shaver Lake region to boat, water ski, snow ski or sail, this will be a most enjoyable stay. Or, if you just need a little 'getaway' for peace and quiet, this would be the place. We also have installed new flooring throughout the cabin. Under new ownership, the cabin has been updated throughout. The Herrera Hideaway is a short walk to 'The Village' of Shaver Lake where shopping, cocktails, coffee, and local crafts are available. The historic Trading Post restaurant is a short walk down the road. Shaver Lake offers a wide range of family activities during the summer months and turns into a 'winter wonderland' during winter months, with the ultimate sled run right behind the cabin. Shaver Lake is a quick 5 minute drive or 15 minute hike away! China Peak Ski Resort is a 30 minute drive North. Dinky Creek and honeymoon pools are 15 minutes east, and there are several waterfalls and hikes in between! It's always been a dream of ours to own a little piece of Shaver Lake. Now that our dream has become a reality, we can share our cabin with you! My wife , Korrie, and I have 3 children. My wife is a Teacher and I am a Realtor. My family enjoys traveling, adventures, and having fun! We hope that our cabin inspires adventure in your family as well! During the summer and fall months we enjoy sitting on the deck overlooking the forest reading the newspaper and enjoying a cup of coffee. After a day on the lake there is no better place to relax. During the winter months we enjoy sledding in the 'back' of the cabin, long walks in the snow on snow shoes or just relaxing in front of the gas fireplace reading a good book and enjoying a warm cup of chocolate! Only a 5 Minute walk to downtown to all the shops, stores, restaurants, and bars. Perfect for our little family! Perfect little cabin getaway in the snow. The owners were very responsive and even FaceTimed to help us find our way in the snow. I’m not sure who enjoyed themselves more, my husband and I or our 18 month old and our dog. So happy we read all the reviews and came prepared with chains, warm clothes, a sound machine, an extra shovel and plenty of energy. We’ll definitely be back for a visit in the summer. Cute little cabin we love staying here! We had a great time! The snow is beautiful and the kids had fun. Wish we could stay longer. We will definitely be back. Thank you Adrian & Korrie for opening up your home! Don’t really want to give a bad review but just think there are a few things people should be aware of before booking. *There is no central heating. We had to blast the fire place for a long time for it to bearly reach the bedrooms, making the living space unbearably hot. *Great location. We were able to walk to town which was fun! *Toy box was a life saver! Overall I think the cabin is better suited for a couple or a family with older kids. It would probably be better during the summer or warmer months so you don’t have mess with the heating and you could enjoy the adorable patio space. This cabin was perfect for our family of 5. My wife and I took our 3 small children and had a great time. We originally booked for my wife and I and 2 of our friends but glad it didn’t work out with them due to the small size of the cabin. The only bathroom in the cabin is in the master bathroom so that is a bit surprising but it worked since we ended up going with our children. The cabin was very cozy once the fireplace got going but there is no dryer to dry the clothes after coming in from playing in the snow but the fireplace did work well to dry most of the clothes. They provide everything for cooking except the food and the K-cups and the essentials for coffee. The grill worked great for bbqing and the fire pit was awesome after dinner. For the money you pay it’s a great place to stay. Thank you for your hospitality. Located in the West Village, The Herrera Hideaway is conveniently located a short 5 minute walk to the center of town. Also, The Herrera Hideaway backs up to Sierra National Forest. China Peak is about a 25 Minute drive away and Shaver Lake is only a 10 minute drive to the Marina and a 15-20 minute walk to Shaver Lake. Please read and follow directions that are on refrigerator.